105' Kelly Houseboat 1977 No Doubt This heavy built all steel and self propelled house boat has so much to offer with her three owner and guest staterooms, three full heads, plus a single crew stateroom, natural Louisiana cypress wall paneling and early American furnishings, a massive main deck entertainment area with built in seating, open galley, large dinette table, aft deck game room and a 50X13 bridge deck with a 13X35 awning, two new Kilo Pak 25 KW generators, central air condition, separate pilot house, full walk around decks, plus so much more. The No Doubt makes the perfect corporateentertainment facilityor family getaway! The seller’s lack of time to enjoy her puts her on the market at a very attractive price! United Yacht Sales New Jersey would love to guide you through a personal showing of this 105' Kelly Houseboat 1977. 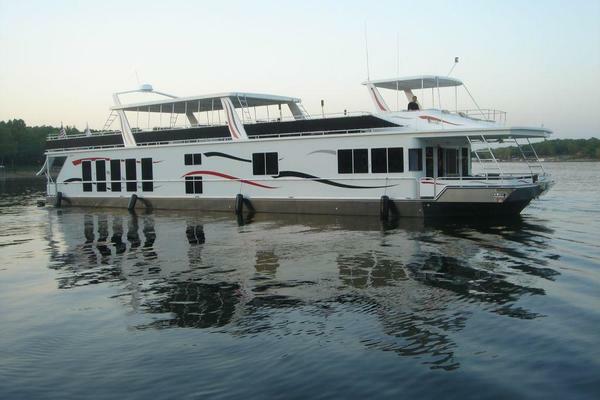 This yacht for sale is located in Morgan City United States and priced at $305,000. For a showing please contact us by filling out the form on this page and we will get back to you shortly! Lower deck-three owner/guest staterooms and one captain’s stateroom.Master stateroom is aft with a queen bed, private head with separate stall shower, oak chest of drawers.Guest stateroom is midship with twin beds, free standing chest of drawers, private access to the guest head with a separate full sized tub/shower and private commode compartment.Guest/VIP stateroom is forward with a queen bed, chest of drawers and private access to the shared guest head.Captains quarters are forward with a single berth, desk, plenty of built in storage and natural heart pine and cypress wood walls and cabinetry.Main deck- pilot house forward, main salon and galley then den/game room.Pilot house with full helm, port and starboard wing doors to Portuguese deck, pilots berth, stairs to top deck.Main salon with a large full head with a separate stall shower to starboard, built in sofa with storage along the full port side wall, projection TV, entertainment center, open galley to starboard with a massive island bar, built in dinette aft and to port, 7’x31” cypress dining table and six chairs, two barrel style easy chairs.Game room is aft and separated by full beam sliding glass doors. There are built in port and starboard sofas, card table in the center with six chairs and sliding glass doors to the steps to the swim platform and top deck.The décor through out the boat is very classic country and features natural woods of cypress, pine, maple, pecky cypress and knotty pine. Bathrooms are tile as are the galley counter tops. The flooring is carpet in the staterooms and vinyl plank style wood look floors in the entertainment areas. The walls are natural woods and painted cabinetry. Most of the free standing furniture is early American solid oak.